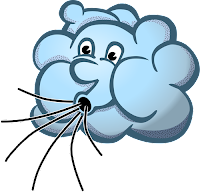 For Friday's group I decided to narrow the focus of the "Weather" theme I had just finished for the Storytime-To-Go program, and do a Wind-themed storytime, and ended up with colors as a secondary theme. We started with our welcome song, then on to the introduction of the topic. We talked a little about weather in general, then about wind specifically. We talked about how you can hear the wind and feel the wind, but you can't actually see the wind, only what the wind does. Then we sang our "story song" to get settled down and ready for our first book. I chose to start with a book that showed several different kinds of weather, Maisy's Wonderful Weather Book by Lucy Cousins. This is a fun book with some small pop-ups and tabs to pull for added interest, and ends with a rainbow magically appearing on the last page. The illustrations are bold and bright, and the text is relatively short and has a nice rhythm. 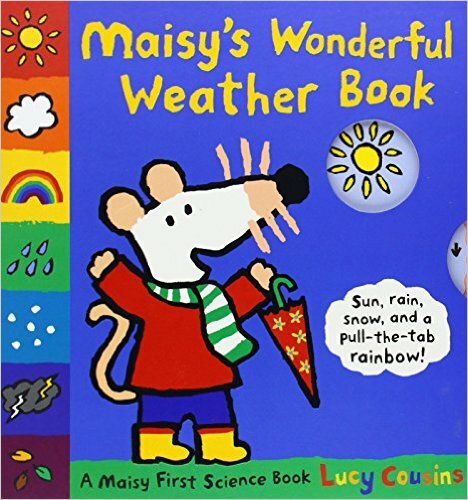 With each type of weather we pointed out how you would need to dress and activities one would do, and when we got to the rainbow we named all the colors. Since they were doing such a good job of listening and participating, I decided to just go straight to the next book rather than doing a song or rhyme. For the next book, I chose one that was short but silly, and had farm animal sounds; a sure recipe for success! 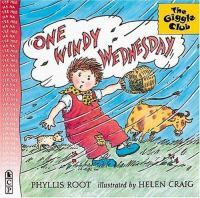 In One Windy Wednesday by Phyllis Root and Helen Craig, a strange wind blows through Bonnie Bumble's farm and blows all the animals' sounds right out of them and mixes them up. Just when she gets things back to normal, another breeze blows by. The kids can help make the wind sounds and animal sounds, and giggle at the pure silliness of it all. We did this twice, and the second time we repeated the fast and slow since they were enjoying it so much. 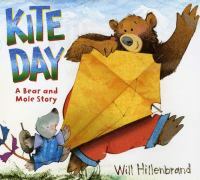 I transitioned into the last book, Kite Day by Will Hillenbrand, by asking them if they knew of something fun to do outside on a windy day. At first they said things like run or play with friends, so I refined my question to something fun you could only do on a windy day. They had to think for a minute, but then someone finally said "fly a kite". [As we read the story I took the opportunity to plug the library when we got to the part where Mole was studying a book (presumably to learn about kites). I asked them where they would go if they wanted to find a book to learn about kites, and a couple did say the library. 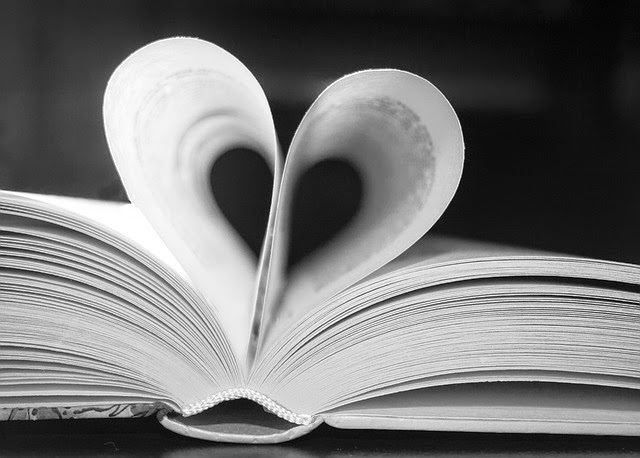 I explained that the library had all kinds of books about lots of different things and they could go to the library and one of the librarians would help the find just the right book.] I also took advantage of all the different colored bows on the kite's tail to work on color recognition. Then what better to follow a kite story than a "Five Little Kites" fingerplay. I had the kids use their fingers to count up, and "fly" their hand like kites, while I said the rhyme and put brightly colored kites (made of craft foam) on the magnetic board. After we did the rhyme, then we counted the kites and named the colors. I took it a step further and asked if they knew what two colors you would mix to make orange and green respectively. They didn't really know, but some of them were able to figure out one of the colors, then I went on and explained how the primary colors could be combined to make the secondary colors. After that, our time was up and we ended with our closing song and passed out stickers. I had 13 kids today, and overall they did really well. The teacher had put nametags on them before I got there, which really helps. A few needed correcting or redirecting, but in general they did much better than in some of the previous visits. They not only did a better job of sitting still and not talking, but they were also very engaged and really participated well. They definitely know the routine, as soon as I sat down one little girl piped up and said, "Now it's time to sing our welcome song!" They seemed to like all the books and activities, and seemed even more engaged in Kite Day than any of the groups I read it to in the previous two weeks, and I was proud when one little boy spoke up and pointed out how Bear and Mole worked together as a team to make the kite, and was the first to respond that the library is where you would go to find a book about kites. To cap off a great storytime, there was absolutely no whining, arguing or pushing while lining up to get stickers!